It's not like the fundamentals of our economy are that much more sound now than they were six or nine months ago. Health care reform still seems like a $2.4 trillion boondoggle intended to benefit those who thrive off our pain. We're still about 20 million jobs below where we need to be for most Americans to be adequately employed. And millions of Americans are still underwater in their homes, if they have anywhere to live at all. And, oh, sure, the bankers are reporting epic profits, but those profits aren't really real. Those profits are there because taxpayers got suckered into giving away the store to the banks, and the banks kept most of the money, called it profits, used it to boost their stock price, and then gave themselves all millions of dollars in bonuses. Heck of a scheme, if you can get away with it. The Dow itself is also something of a farce. You may think the Dow is an average of stock prices, but that's not really the case. It's actually an artificially-generated number gerrymandered by a bunch of guys in suits. Seriously. The Dow is actually managed by the editors of the Wall Street Journal. 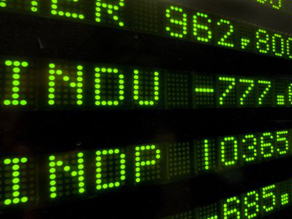 These editors of the Wall Street Journal choose the stocks to be included in the Dow. Choose different stocks and the Dow goes up or down. But to smooth things out and make it meet some sort of editorial standard, they don't just average the price of all the stocks. Instead, they multiply that average by a mystical multiplier - and it's that multiplier that gives them editorial control over the final Dow number you see in all the news. So the mere fact that the Dow broke 10,000 isn't necessarily something to celebrate. It's a cooked number that could have broken last week or next month, depending on the multiplier and set of stocks the editors chose. But still, it's nice to see the Dow is now a shiny, happy number again. Except. Except most investors are, well, to put it gently, morons. That's how we got the dot-bomb bust. Investors follow the herd, they're lemmings, and if someone they trust says things are good, they invest. The reason we had the housing collapse, the financial collapse, and the dot-com collapse all relate to this herd mentality of investors. And if you really want to lead investors around by the nose, there's no lure better than the Dow. It's an easy number. If it's up, they're happy. If it's down, they're sad. Unfortunately, since the fundamentals of our economy are still anything but strong, having a highly positive Dow now means many lemming investors are going to be stupid again. They're going to follow the lure of greed. Regulations still haven't been put in place to fix the last round of idiocy. And someone's going to get hurt. Any guess who? It's not going to be the bankers. They're celebrating their hundreds of millions in bonuses. Nope, it's going to be you and me that get hurt. Because the Dow isn't really real, greedy bankers are going to be greedy bankers, and, at 10,000 in this economy, it's all a house of cards. Unfortunately, you can't live in a house of cards. When it collapses, and it will, let's hope you and I live inside something more substantial - and that we'll still be able to pay for where we live after the bankers and the insurance companies finish sucking us dry - just so they can have another Happy Dow Day. And yet the Gov't keeps printing more money and spending it on projects that don't actually CREATE jobs. Really create. Not just save or shuffle around. This is the best no-nonsense analysis I have ever read about the Dow. Thanks. Thats it, focus on pessimism. That will fix everything. Honey, you need to stop this. Especially since all you are doing is scaring people. The only way things are going to get fixed is if we all stop focusing on what negative things COULD happen, instead of what positive things there is to look forward to. Good article, David! You're absolutely right, the DOW indicator is nothing to celebrate – it's just a psychological boost so the BO admin. can claim some form of credit. Obama is so Naive he will declare victory cause the Dow is over 10,000. Our 401k's are not even close to being recovered, not that he cares about people who are responsible enough to plan for their retirement years. The economy isn't recovered until unemployment drops. Obama needs to take some business classes, since he doesn't seem to understand how small business operates. A community organizer with NO real experience does NOT make a good president.